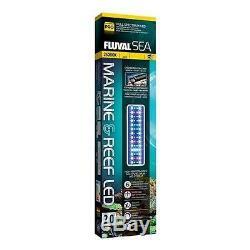 FLUVAL - SEA MARINE & REEF 2.0 LED AQUARIUM LIGHT 24" TO 34". With 6 unique LEDs, the German-engineered Fluval Sea Marine & Reef 2.0 LED Aquarium Light 24-34 provides your corals full spectrum exposure for vibrant growth, color and health. Featuring Waterproof IPX7 engineering, Marine & Reef 2.0 easily endures regular splashing, and can even sustain complete submersion in the event the unit is dropped under water accidentally. IPX7 also allows the light, with its ultra-slim 1 profile, to be positioned directly above the water surface for better light penetration and efficiency. Works with the Fluval WiFi LED Controller. Customize light intensity and duration from your mobile device. 21.85" X 2.6" X 1. Legs will expand to 34. Dimmable LED with illuminated touch switch control: off (red illumination), all lights on (blue illumination), only blue lights on (purple illumination). 32 Watts / 1350 Lumens. This full spectrum light includes blue (400nm, 420 nm, 440nm, 460nm), red (620nm) and 15K LEDs. 50,000 hour expected life. We learned early on that going that extra inch can help your business tremendously. Our primary warehouses are in PA, TN and AZ. Setting up our store in this manner makes for a better overall experience for you the customer. The item "FLUVAL SEA MARINE & REEF 2.0 LED AQUARIUM LIGHT 24 TO 34" is in sale since Wednesday, January 27, 2016. This item is in the category "Pet Supplies\Fish & Aquariums\Lighting & Bulbs". The seller is "saltwateraq" and is located in Fairfield, Pennsylvania.